Wall paintings from India pay homage to the rich and glorious past of Indian culture and heritage. This practice of creating beautiful miniatures reached its peak during the Ajanta dynasty and was taken to further heights during the Mogul reign. The legendary Mogul’s were famous for their patronizing of art. The tradition of miniature painting was started in Iran and assimilated beautifully with the Indian heritage. During the Mogul dynasty this art reached its peak under the patronizing of Mogul Emperor Jahangir. It is a sad fact that many of the beautiful paintings created by lesser-known artists have not been recognized by art connoisseurs of the world. It is only recently that many of the fine arts and crafts created by different artists have been located in private collections. A closer study and analysis of the work shows a fine understanding of the art of miniatures along with the finesse in craftsmanship. The region of Rajasthan is known for its paintings named after the different tribes however there are regions like the Malwa which has one name to depict all kinds of paintings originating from this area. This was a Central zone in India and the art of miniatures flourished in this place well before the times of the Moguls. Each part of this state has its own traditions which are clearly depicted in the different Indian miniatures that belong to this area. Another princely state of India called the Raghogarh state encouraged its artisans to create beautiful miniatures. It was greatly influenced by the neighboring states and the cultural trends of the neighbors were reflected in their paintings. In fact the rulers of the state were fond of hunting and their excursions were often captured in miniatures created by the painters in that area. Battles and wars were often captured on this miniature canvas with great detail and beauty. Slices of life from the ruler’s court were beautifully preserved in Indian miniatures and are often replicated by budding artists who want to master this fine art. The art of Indian miniatures dates back to 1700 BC and represents a visual narrative of different activities from that time. Since the artists were commissioned by rulers and courtiers of ancient times, they often worked on depicting the lifestyle and activities of those particular people. This unique tradition has gained a lot of attention in recent times and in fact many schools and institutions have compiled knowledge and information to teach it to a new generation of fine arts students. It is interesting to note that an exhaustive attention to detail is the main focus of this minute painting. 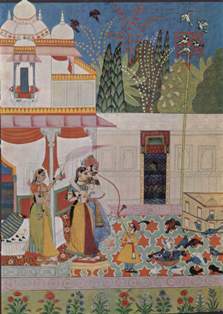 The traditional themes may range from the epic battles depicted in Sanskrit books, the life of the courtiers in the Mogul era or maybe the hunting, entertainment and social activities of different elite who sponsored the artists for their creation. The different schools of thought range from the Mogul to the Malwa, Rajhasthan and the Bundi style of the Hadoti region. Each of these were distinct and unique in their own right. A few of the miniatures were created on famous love stories which has spanned centuries of cultural history in India.